By 2050, the world’s population is expected to grow to nine billion people, a population increase which will require boosting global food production by 70%, according to the UN’s Food and Agriculture Office. And yet, according to a recent report by this same UN agency, 1.3 billion tons of food is wasted each year while nearly 900 million people around the world struggle each day with hunger. In the U.S. alone, 40% of the food produced each year goes to waste. That’s $165 billion worth of uneaten and wasted food, according to a report authored by the Natural Resources Defense Council. 80% of our nation’s freshwater, 50% of the land and 10% of the U.S. energy budget is spent on food production. Many factors contribute to food waste, including portion sizes which have ballooned in a little more than a generation. For example, between 1982 and 2002, the average pizza slice almost doubled in calories and even our humble dinner plate has increased two inches in diameter since the 1970s, according to Dana Gunders, an NRDC staff scientist and food waste expert. 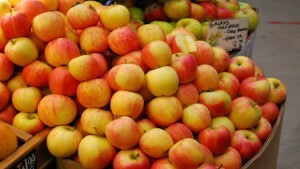 Food waste occurs not just in our homes but in grocery stores, restaurants and farms. In fact, more than half of all the fruits and vegetables grown in the U.S. never get eaten, and most of this produce never even gets to market since it it doesn’t meet size or appearance specifications for retail sale. Another culprit of food waste can be found in the use or sell by or “best before” dates stamped on practically any packaged food. As a new report co-authored by the NRDC and the Harvard Food Law and Policy Clinic makes clear, those dates are placed by the manufacturer to indicate a product’s freshness, not its safety. One survey found that the dates confuse whopping 90 percent of respondents to throw out foods past their expiration dates out of a mistaken belief that the items are no longer safe to eat. Moreover, there is no consistent, federal expiration date labeling system, which is why the expiration date listed on a box of granola bars, for example, is up to the manufacturer to determine, along with the choice of wording (‘sell by’ versus ‘best before’) and even where it is listed on the product. So the report’s authors came up with suggestions to improve the current confusion over expiration dates, including the elimination of “sell by” dates or other dates which are designed to inform the retailer when to remove the product from the shelf. Before producing this story, I confess to being a bit complacent in my own food shopping and dining habits. After all, if I didn’t finish that meal or if that leafy, organic kale had been sitting in the fridge for a few weeks without being used, I could always compost it and buy more, right? Maybe, but what this attitude ignores is the unseen cost of food waste: namely, the enormous amount of resources utilized in growing, harvesting and bringing that produce and food to market. For example, 80 percent of our nation’s freshwater, 50 percent of the land and 10 percent of the U.S. energy budget is spent on food production, which is why wasting food is tantamount to wasting environmental resources. Also, “not all food waste is equal,” according to the NRDC’s Dana Gunders. When you throw out a hamburger, the amount of water that has been used to produce that hamburger is equal to taking a 90-minute shower, as she explained to me. While it would, of course, be great to curb all forms of food waste, knowing the amount of land, water, and energy it took to produce that Big Mac may help us at least begin to realize the environmental toll that dairy and meat products take when they go uneaten. Today the fight against food waste has met the digital age through the use of social media and new websites that have sprung up to crowdsource surplus food at farms, grocery stores and businesses. Perhaps simply being aware of the hunger which afflicts millions of Americans can change how we view the food we eat, and more importantly, the food we allow to go to waste. Sheraz,well written and timely article.We all have to learn a lesson from this and help saving the environment and resources. The large amount of fresh food waste is a lose-lose situation for the environment, retailers and the struggling families in today’s tough economy. 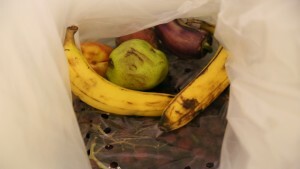 The excess inventory of perishable food items close to their expiration in supermarkets causes waste. Why not let the consumer perform the perishables rotation in the supermarket by offering him purchasing incentives for perishables approaching their expiration dates? There is a new GS1 DataBar global standard that enables an automatic incentive offering application for fresh food close to its expiration. The EndGroceryWaste application, which is based on GS1 DataBar standard, encourages efficient consumer shopping behavior that maximizes grocery retailer revenue and makes fresh food affordable for all families while effectively reducing the global carbon footprint. You can look this application up at EndGroceryWaste site.